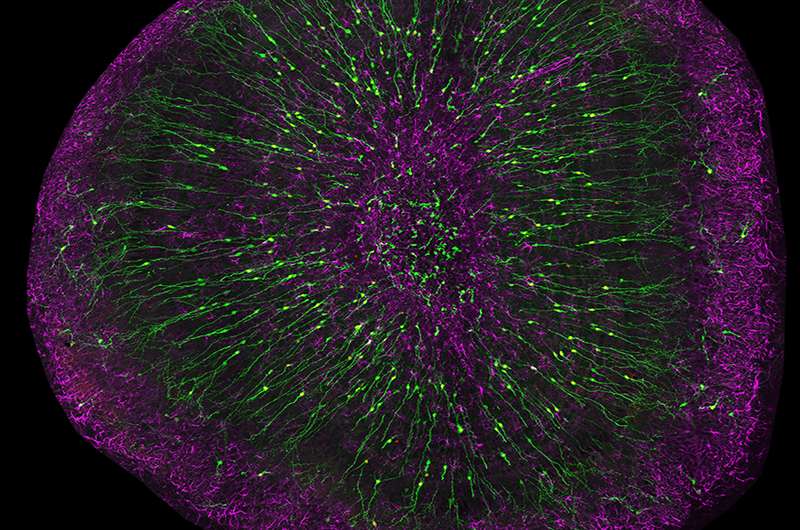 Looking at a winning submission for the first-ever George Washington University School of Medicine and Health Sciences (SMHS) Art of Science Contest, one might not know the bright purple and green colors represent olfactory bulb interneurons and astrocytes in the brain; but that’s the beauty of art: there’s more to it than meets the eye. The contest shows off the amazing research medical students, graduate students, and postdoctoral fellows are conducting “through dynamic and beautiful images,” said Alison Hall, PhD, associate dean for research workforce development and professor of neurology as SMHS. This year’s four contest winners — chosen by a team of SMHS deans, students, and staff — received small cash prizes and will have their images displayed in the Dean’s Suite in Ross Hall. Grand prize winner, first-year MD student Aslam Akhtar, PhD, said a push from classmates and class discussions about the olfactory bulb neurons, which are the neurons responsible for our sense of smell, led him to enter his image in the contest. This year, 12 images were submitted for consideration, and Hall said she hopes even more images, reflecting even broader approaches are submitted in the years to come. The contest will be an annual event, with the winners each year adding to the display in the Dean’s Suite and SMHS communications. Hall added that the beauty of the entries is what makes the contest so interesting.